July 31 Is National Heatstroke Prevention Day. The National Highway Traffic Safety Administration (NHTSA) and SafeKids.org are asking you to help raise awareness about the dangers of kids and cars through a concerted day-long social media conversation on July 31. >> No child should die of #heatstroke from being left alone in a hot car! >> If you see a child alone in a hot vehicle, call 911 or your local emergency number immediately. If the child is in distress due to heat, get that child out as quickly as possible. Cool the child rapidly by spraying the child with cool water or with water from a garden hose (an ice bath isn’t necessary nordesirable). 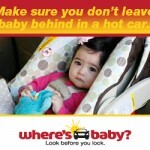 Visit www.safercar.gov/heatstroke http://www.safercar.gov/heatstroke ] for more information. http://www.facebook.com/NHTSA ] and Twitter [ http://www.twitter.com/@nhtsagov .